Lighting-Gallery-net - Incandescent - General Service 25-100 watt/Box of bulbs!!! Eye candy!!! Box of bulbs!!! Eye candy!!! ReStore find. Had to grab the whole thing. Awesome finds. I would have grabbed the whole box as well. I see Westinghouse T19 lamps! That's the candy I love to see! Great find especially those Westy Eye Savings lamps. Awesome especially the Westy 40 w eye saving T bulb pack. Long live the great old 20th century quality in electrical & lighting products! 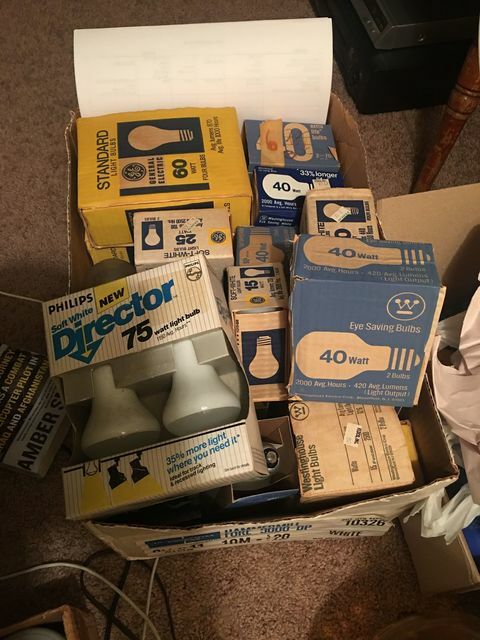 LOL I just got a box of bulbs like this (not as good as this, but still lots of goodies) last week at the ReStore. Wow what great finds! My local ReStore had those same Philips Directors in 40 watts with original packaging last week. Unfortunately one of the two was already EOL, so I decided not to get them. How much was the box? I would get the box if it was cheap.